to whom it may concern; I live in Gloucester County VA, I was looking to purchase a midsize truck,four door, five passenger seating. I started looking on cars.com and found several trucks of interest. I saw this truck at CXB Auto Sales and said if it looked as good as the pictures on cars.com I would buy it. I made an appointment with Joe to see and drive it. Carmax said it was a great buy and car fax backed that claim. Joe is a good man and I would buy from him again, it was a real pleasure working with him. Just bought an awesome toyota 4Runner from CXB Auto sales. 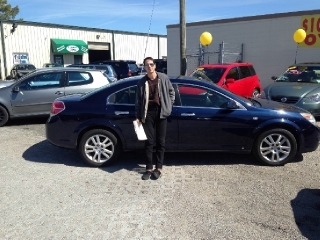 Joe was kind, patient, knowledgeable and went the extra mile to help us decide on the car. He drove the 4runner to our trusted mechanic for an inspection and fixed the few small things that were picked up that same day. I would strongly recommend considering buying your next car here if you're looking for a quality vehicle and a no pressure buying experience. Joe specializes in used, late model, in very good condition cars and trucks. Joe goes the extra mile to make sure the vehicle is in pristine condition before he delivers it to you. He is up front about the pricing but laid back in his sales approach. He has a Carfax report available for every vehicle he sells so you can scope out any issues with the car before the test drive. He does all the registration and DMV paperwork for you, and if you are Active Duty or Retired Military, he waives the processing fee. If you are looking for a fair-priced, great condition car or truck—go see Joe!! Great dealer to do business with. Very pleased with my dealings with CXB Auto Sales. Joe is very knowledgable about the vehicles he is selling and a pleasure to do business with. Highly recommend giving him a try for your next automobile purchase. Joe and CXB Auto were great. Joe found me exactly what I was looking for and was very patient and understanding throughout the whole process. If and when I need another vehicle I will definitely go and see Joe. I recommend anyone and everyone to call Joe when you need a vehicle. Thanks Joe and CXB! I recently purchased a 2006 Honda Civic a few months ago for my son from CXB Auto Sales. It has been many years since I purchased a used car and I can honestly say that it was a pleasant experience. I did not feel pressured or hassled into buying any of the cars on the lot. Mr. Joe Tuozzoli was very laid back, courteous, and professional towards my son and I. Joe was more than willing to meet us on our schedule to look at cars, test drives and to work with us to have the car we wanted inspected at my mechanic before we bought it. The paperwork was quickly done and he followed up within days in getting the title transferred and the plates in hand. I would have no issues coming back to this dealership for another purchase and would recommend it to my friends. I recently purchased a 2005 Honda Pilot EX-L from CXB Auto Sales and I can honestly say that it was a very pleasant experience! During the whole process, not once did I feel pressured or hassled into buying any of his used cars!! Mr. Joe Tuozzoli was very laid back, courteous, and very professional towards my family and I! He is very personable and genuinely cares about his customers and their satisfaction! I have a very busy schedule, but yet Mr. Tuozzoli was more than willing to meet me on the weekend, and I was very pleased with how all of the paperwork went, it didn't take hours like a lot of places do! So far, I am very happy with the Honda Pilot that I purchased and I would highly recommend CXB Auto Sales to any one of my family or friends!! In the future, when I'm ready for a new used vehicle, I can tell you that I will definitely be returning to CXB Auto Sales as a repeat customer! Thank you to Mr. Joe Tuozzoli for such a great car buying experience!! Joe's style is relaxed and low pressure. I felt comfortable with him and believe I was treated with honesty and respect. And I came away with a great deal on a car I really wanted. Next time I'm in the market, I will definitely see what Joe has available before I buy anything. I have purchased several used cars over the years and recently purchased one from Joe Tuozzoli, not your typical car dealer. In my experience, when I go to see a car, the dealer is continuously trying to sell me, using phrases like “don’t miss this great deal” OR “I have a lot of interested people, better buy today” OR they continuously chatter about nothing while you’re trying to focus on the test drive. To give you an idea, with each question I asked, I got a straight forward answer, with zero sales pitch, unuse to this, I said jokingly; you do want to sell this car, right? His response was a smile and something like; I don’t do sales pitches, I chose only well maintained cars, in best possible condition, so I let the car sell itself. After talking with him longer, it is clear he really does take a personal pride in what he does and how he treats people. The car I purchased from him had something I never saw before, a perfect maintenance record thru carfax which noted all servicing had been done at the manufactures recommended milestones. I am sure there are other auto brokers out there with similar characteristics but so far Joe is the only one I have met. I have recommended him to family and friends. Great Car, Great Salesman !